I’m a regular writer and sharer of useful articles on positive classroom management strategies (see Best Posts On Classroom Management) and on the importance of building teacher-student relationships (see The Best Resources On The Importance Of Building Positive Relationships With Students). Studies have recently come out on applying a technique known as “establish-maintain-restore” (it refers to relationships) in elementary and in middle schools. As the text box at the top of this post highlights, the research found this strategy to be very successful. Of course, that shouldn’t come as a surprise to the many teachers who have been implementing this kind of positive relationship-building focus in their classroom for years, but it never hurts to be able to point to research when defending what we’re doing to potentially critical administrators. Of course, who among us really wants to read dry academic studies? You’ll want to read his article, The Key to Effective Classroom Management and, I think, share it widely. 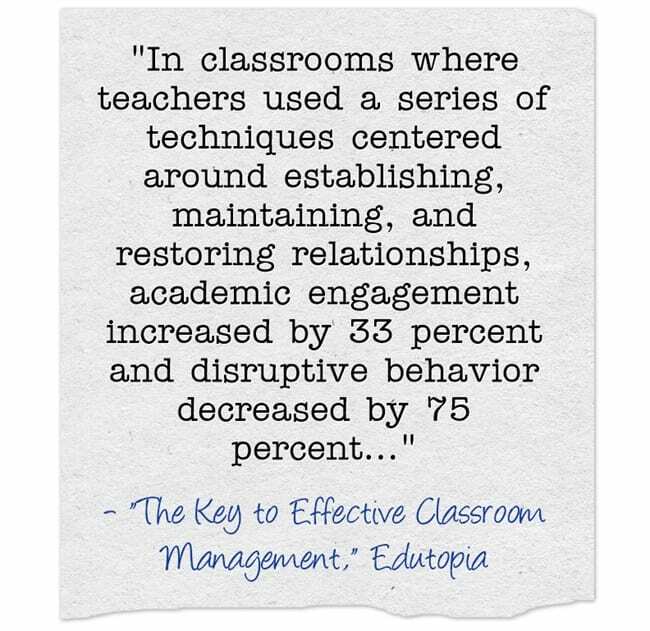 It’s definitely one of the best pieces I’ve read on classroom management. PreviousHome Culture Project – With New Examples & Student Handouts!